YIKES! Facebook engagement has lost 20+% since January 2107! 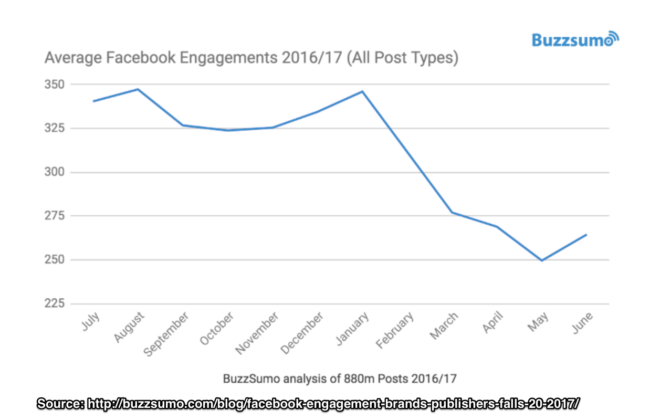 BuzzSumo data analysis by Steve Rayson confirms what you’ve been experiencing: Lower organic Facebook engagement. Facebook engagement has been a key driver of the company’s revenues and valuation since it went public in 2012. 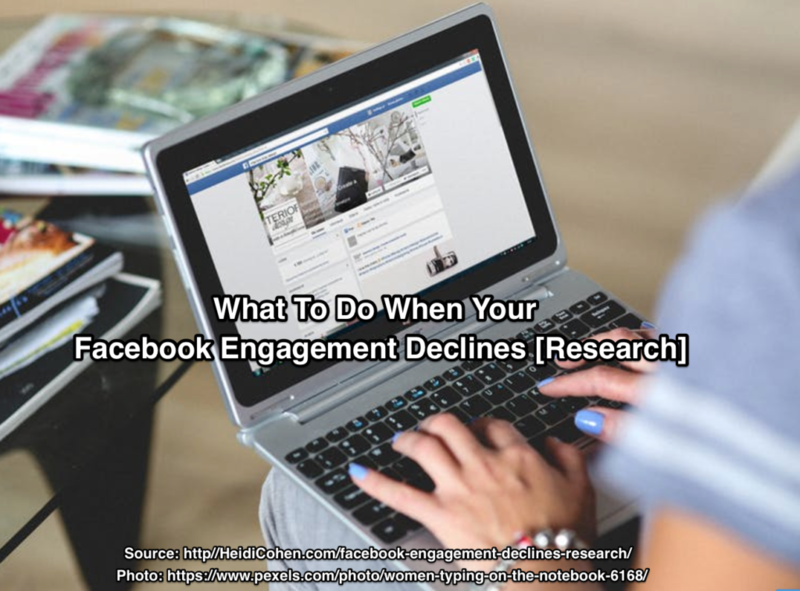 While Facebook engagement declines have a big impact on your marketing you shouldn’t be surprised. Facebook has been telegraphing this would happen for a while. They just haven’t put it in terms of decreased organic engagement. Facebook’s growth rate has matured. They no longer have big segments of non-users to tap into. As a result, their growth rate slowed significantly. Even worse, it’s no longer the first choice for teens. Facebook’s newsfeed has an upper bound to the number of items it delivers. It’s set at 1,500 per user based on internal Facebook analysis. Facebook has become a bona fide media entity. WPP’s Sir Martin Sorrell announced Facebook was their second largest media investment after Google in late 2016. Aggregated data supports Facebook’s advertising standing. 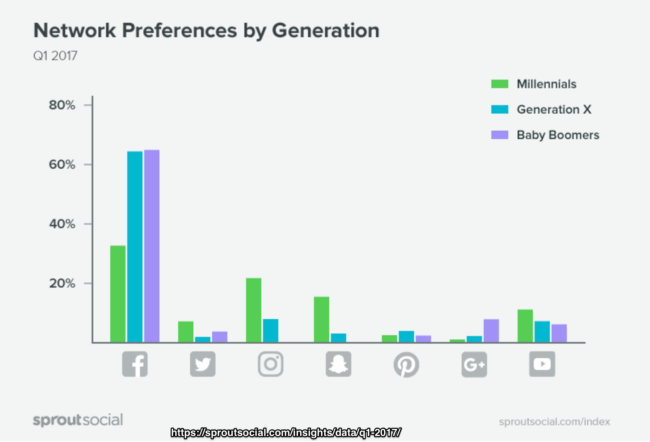 Before you fret about your 2018 marketing budget, let’s look at the data to see where there are opportunities to support your business and mitigate the impact of Facebook’s engagement falloff. 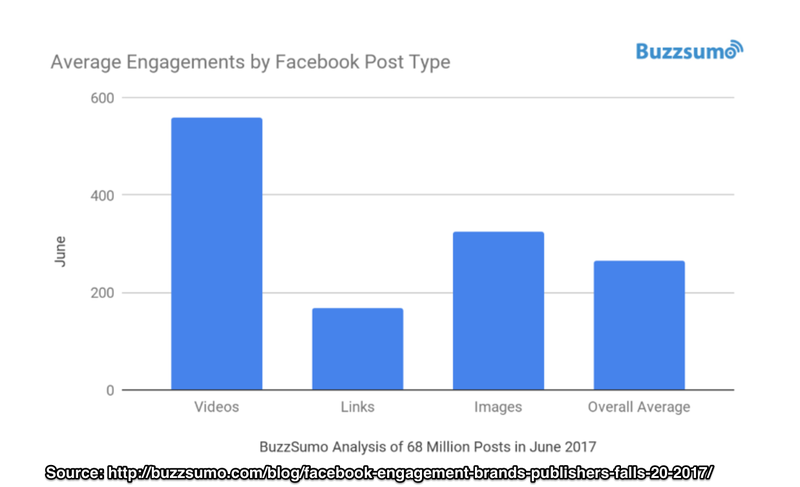 BuzzSumo analyzed 880+ million Facebook posts published by brands and publishers. Deeper examination of the data reveals the falloff is larger for plain Jane links and images. No surprise—whether we like it or not, as humans, we’re wired to see things that move. Hence video and interactive content draw our attention. Take look at the numbers for yourself. You’ll see a total post falloff in December, January and February. This may be attributable to the post-holiday push. Post publication picks up for spring promotions. Additionally videos remain a small proportion of total posts. 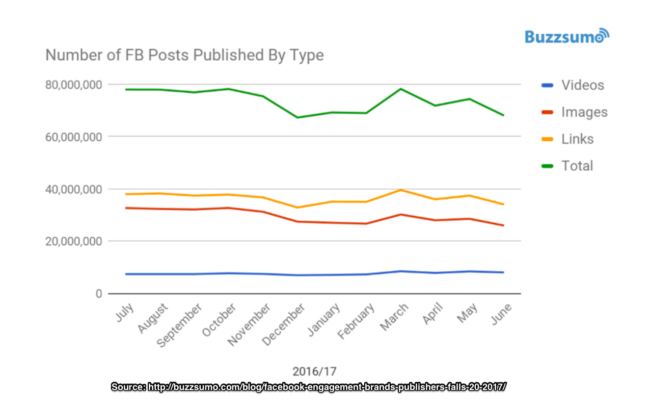 This is visually apparent from the line chart of Facebook posts by content type. How to deal with Facebook engagement declines. Make video a key element of your Facebook marketing. Take advantage of the opportunity to stand out in the newsfeed despite Facebook engagement declines. Use a variety of Facebook video options. Test what works best for your specific audience. Despite Facebook engagement declines, the site remains the 800 pound gorilla of social media and media more broadly. As a result, you still need to be present on Facebook. Therefore, you must be smart about your Facebook strategy. Create a sustainable Facebook strategy aligned with your marketing and business strategies. Ensure that your Facebook goals, audience and content context are aligned with your overall marketing approach. 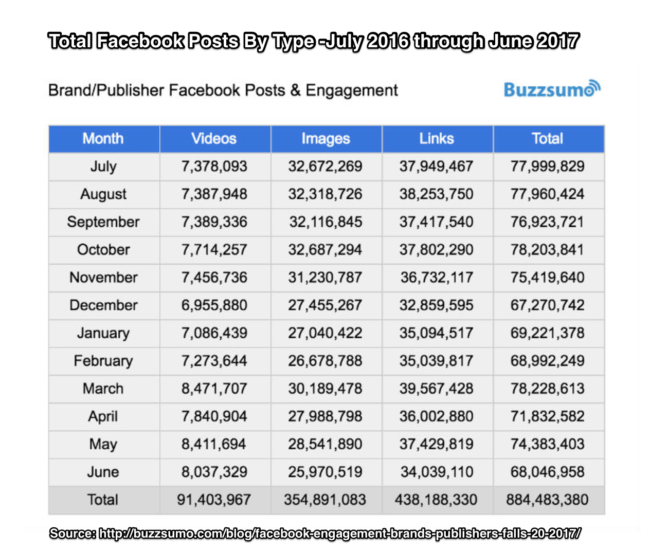 Last year, Buffer’s research showed that small businesses have kept their organic Facebook posting rates the same or higher despite lower Facebook visibility. 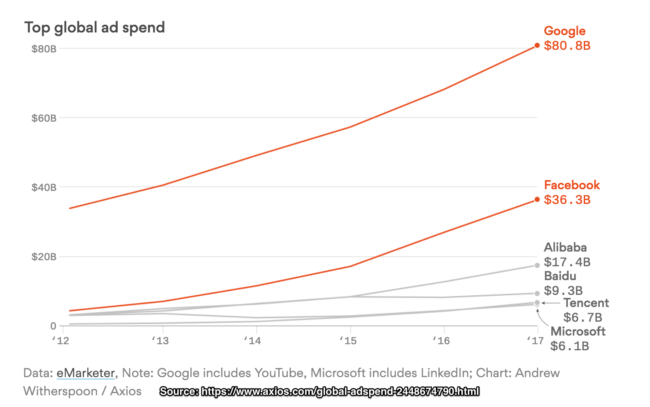 And these are marketers with small to non-existent marketing budgets. Create content tailored for your Facebook audience and post on a regular basis. Aim for one engagement per day. Test to see which timing works best for your audience and content. Invest time in build Facebook engagement. Nurture and keep the conversation going on your Facebook page. Support your major content efforts by being available and responding to readers and influencers. Get employees outside of your marketing department involved. Shift your Facebook content mix towards increased video. Integrate your Facebook oriented content creation into your content marketing editorial and social media calendars. Support your best content with Facebook advertising. Use Facebook advertising to test headlines and images. Take advantage of Facebook’s gold mine of user data to target your content. 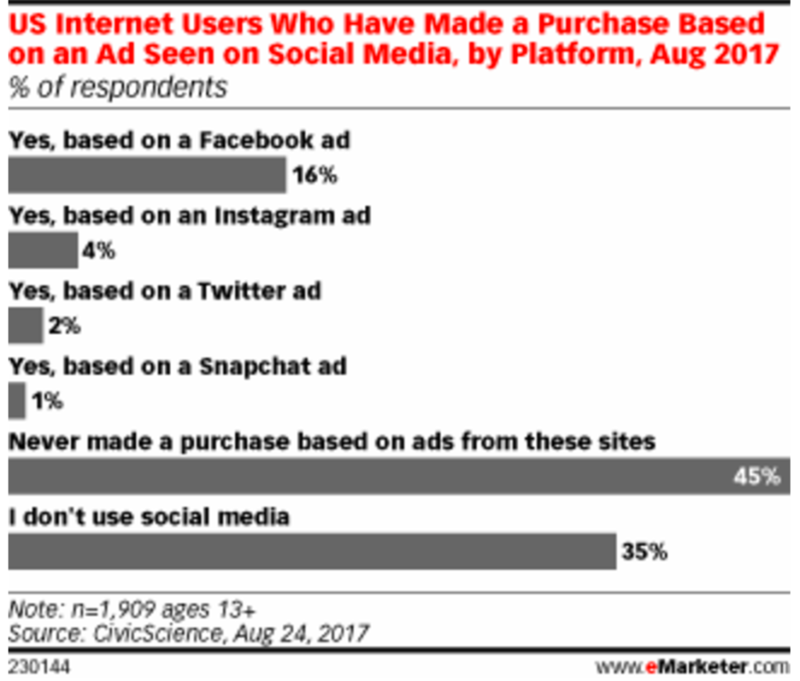 45% of respondents have never purchased a product or service based on seeing a social media ad according to Civic Science. People have fine-tuned their ability to ignore digital ads including on social media where they’re focused on engaging with family and friends. 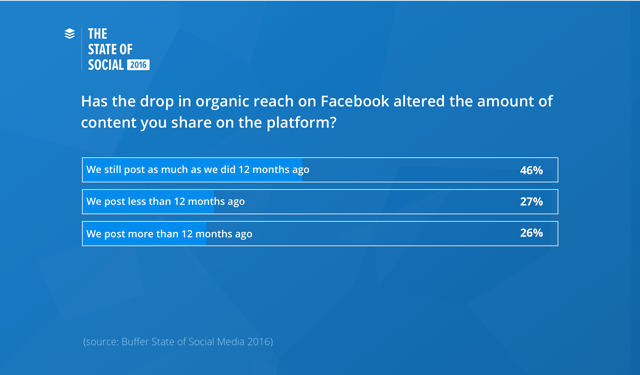 Despite that, 16% of respondents have purchased after seeing an ad on Facebook. As a marketer, you must think beyond Facebook to build your base and keep your audience engaged on Facebook. Greet visitors from Facebook with a targeted experience. At a minimum, be consistent and use a tailored landing page and welcome series. Create quality 10X content. Particularly work on your headlines to maximize attention. Where appropriate, include video and encourage sharing. Also, A/B test your headlines with paid advertising on Facebook. Schedule engagement with your content on owned media entities such as your blog, email newsletters and employee emails when you plan your social media engagement. Tap into the power of your events, both online and IRL. Create a Facebook Group to support your event and ask people to join once they’ve signed up for your event. Spend time engaging with followers and create reasons for them to engage and participate. Make your Facebook engagement personal. Reach out to your personal network as well as your employees to get them to Like and engage on your Facebook Page. Beyond that, do personal outreach to colleagues and influencers for key pieces of content. 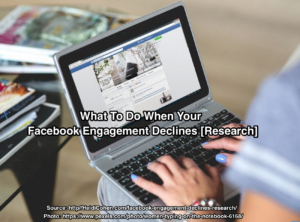 Despite Facebook engagement declines, you still must include Facebook in your social media and marketing mix. This means allocating budget and time to actively engage with your Facebook audience. Facebook is too big to ignore. 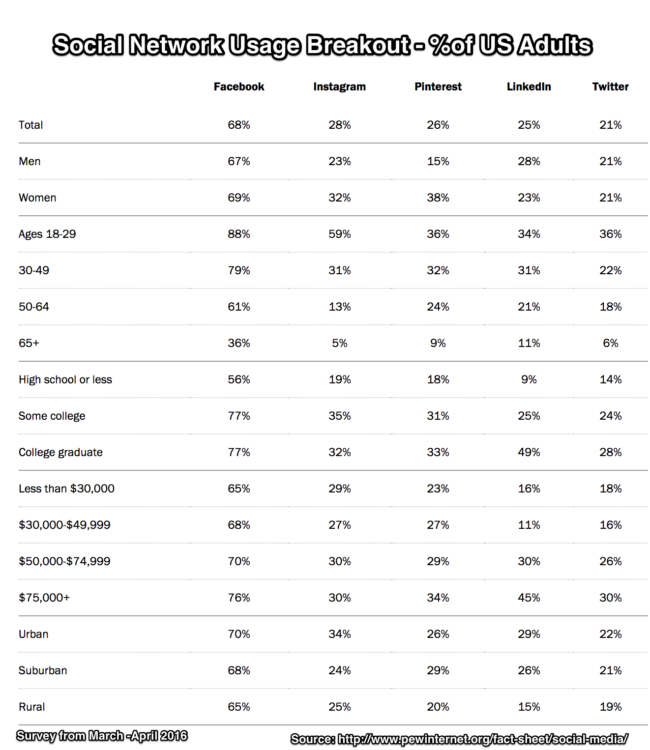 Even with a one-fifth falloff in engagement it remains the largest and most diverse social media platform. You can’t match it’s marketing effectiveness and cost-efficiency. Therefore assess your marketing strategy to determine where you can effectively support it using Facebook together with your owned media entities. Tags Buffer, BuzzSumo, Chart, Civic Science, Facebook, Research, Sprout Social. Bookmark the permalink. Marketing platforms have risen and fallen throughout the years. I imagine the only way to become resistant to this trend is to strengthen your owned media (blog, email list), as you allude to. Really a very nice & informative post with all aspects of Facebook User Engagement covered.